Crafted in our bakery with yeasted dough, these sweet pull-apart breads are deliciously easy to enjoy. 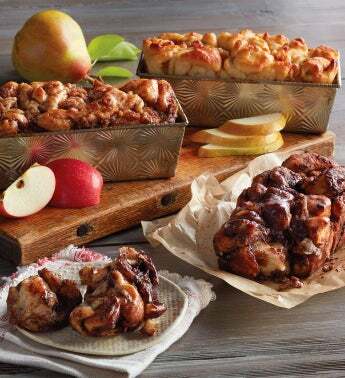 Delectable apple fritter pull-apart bread uses both real butter and cinnamon apple butter. Pear maple pull-apart bread has wonderful flavor and texture from the addition of applesauce as an ingredient. Hot chocolate pull-apart bread is a delightful surprise, made with rich, sweetened cocoa and marshmallows. Perfect for holiday mornings or leisurely afternoons with loved ones.